Attached please find our flier for Pre-Enrollment for Seniors 65 and old on a fixed income. This will allow WACOG to apply $800.00 towards client’s electric bill. Our goal is to have our seniors not to choose between eating, medical prescriptions or paying their electric bill. If you have any questions about this program. Please call Christina Pfleiderer at 928-377-1069. • Pre-College Advising: information about accessing benefits and help determining which college, university or technical school for a chosen field. • English and Writing Essentials: Instruction in understanding and developing spelling, reading and writing skills. • Introduction to Mathematics: Review of basic arithmetic skills and introduction to algebra, geometric shapes, formulas and the metric system. • Advanced Math/Pre-Calculus: Take that next step in preparing for engineering and higher level math courses. • Computer Basics: Introduction to computer hardware, software and Internet use. • Survey of Lab Sciences: Learn concepts of scientific investigation, classifying organisms, analyzing data, conducting experiments and basic lab procedures. 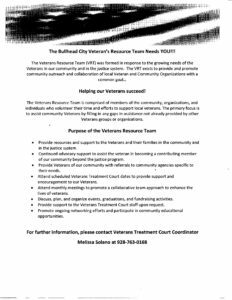 • Community & College Resource Referrals: Connecting veterans with programs and services designed to support their success in college. To be eligible, veterans must have served at least 181 days and had any discharge other than dishonorable. Our priority includes veterans who are low-income (based on the federal guidelines) and/or who are first-generation college students. Interested veterans can learn more and apply online at WWW.YC.EDU/VUB. Square with blue background that describes basic overview of how Veterans enrolled in VA Health Care access community care. The image explains the process in three main steps. Step 1: Go to VA. Schedule an appointment with a VA provider (doctor). Your VA care team will work with you to see if you are eligible for community care. Eligibility is based on your medical needs, care that is available at VA, and other requirements. Important: Make sure VA confirms you are eligible and authorized before going to the next step. Step 2: Make an Appointment. VA will work with you to find a community provider and make an appointment. 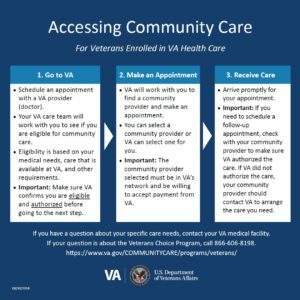 You can select a community provider or VA can select one for you. Important: The community provider selected must be in VA’s network and be willing to accept payment from VA. Step 3: Receive Care – Arrive promptly for your appointment. Important: If you need to schedule a follow-up appointment, check with your community provider to make sure VA authorized the care. If VA did not authorize the care, your community provider should contact VA to arrange the care you need. If you have a question about your specific care needs, contact your VA medical facility. If your question is about the Veterans Choice Program, call 866-606-8198. You can also visit this link for more information https://www.va.gov/COMMUNITYCARE/programs/veterans/ Image includes VA seal. Because there are so many questions regarding the Mission Act, I’d like to share with you some information on accessing community care. This information will be helpful when your constituents have questions and concerns about community care. Recently, a Veteran wrote into us that as soon as the Mission Act was signed, he went out and sought care on his own through the community. This care was NOT authorized and the Veteran ended up with a $4,000 bill that through Congressional law the VA is unable to pay. Please help us fill the knowledge/information gaps related to community care. It’s imperative. The following resource lists are updated. Click on the links to open the pages.